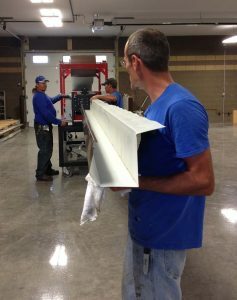 Advanced Metal Fabrication is your premier source for commercial gutters in the Great Lakes region. Located just outside of Toledo, Ohio in Maumee, our facility is conveniently accessible for picking up your finished commercial gutters, or your gutter systems can be fabricated right at your job site! Delivery and installation services are also available – contact us for details. When you need commercial gutter fabrication for your project in the Great Lakes region, depend on Advanced Metal Fabrication! Backed by over 5 decades of combined experience in the metal fabrication industry, you can count on us for unsurpassed customer service and flexible options to meet your needs. AMF is fully insured and bonded. Contact us today at 419-891-4030 to get started on your commercial gutter project and for current pricing information. Ask about our gutter fabrication machine rental services – contact us for details.